Katniss Everdeen has achieved a great victory in surviving the Hunger Games, but she is about to find that her troubles have only just begun. "The Hunger Games" worked reasonably well as a stand-alone novel, so its first sequel had a bit of a challenge in trying to add something new to the story. Superficially, the structure is similar to the first book, beginning in District 12, Katniss' relatively peaceful backwater home and ending in the arena of the 75th Hunger Games, but this time around more time is spent in District 12 and on Katniss' fractious relationship with the dystopian government who see her as a potentially dangerous rebel for her actions in the first book. 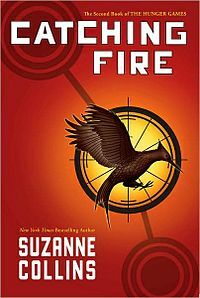 The novel is good at portraying the idea that everyone who takes part in the Hunger Games is a victim, even if they happen to be one of the Victors, and at times Katniss' predicament in this book seems trickier than when she was being hunted by the other competitors. She can often be a frustrating character, particularly when dealing with the potential love triangle between her, Gale and Peeta, but her confusion and sometimes foolish actions are very believable for a teenage girl thrust into an impossibly stressful situation. For much of the novel she really is in a no-win situation. As in the first novel, it's the Hunger Games themselves that are the most compelling part of the story and in some ways this exceeds the similar section in book one. The new arena is more imaginative, featuring a number of memorable traps, and since more is known about the different competitors this time around the secondary characterisation in this part of the story is better. There's also an interesting subtext as it becomes increasingly clear that aspiring rebels have their own plans to subvert the Hunger Games to their advantage (although it takes Katniss' narration quite a long time to catch on to this). The part of the novel in the arena does seem slightly rushed and nothing in it has quite the same emotional impact as some of the Katniss-Rue scenes in the first book, but it does build to a great conclusion that manages to tie together many of the book's themes and subplots. The could have been the difficult middle novel in a trilogy but it does a good job of expanding on the first book, while also being a satisfying read in its own right. Arguably it's the best book in the series.